George “The Animal” Steele was born James Meyers in Detroit, MI in 1937. George Steele initially had a career in teaching and coaching in the Madison school system. James Meyers debuted under a mask, in Detroit, wrestling as “The Student” to keep his identity a secret from his real students. ~~~The Student was a member of the long-running old-school heel stable Gary Hart’s Army. ~~~Eventually, he dropped the mask and became George “the Animal” Steel, a very unorthadox ‘wildman’ wrestler. Robert Louis Howell wrote: George Steele’s legit brother donned the Student Mask and work as George’s tag team partner and protege in the Pittsburgh territory under the name of “Professor X”. Anonymous wrote: In the early 70s, wrestling matches were held about every three weeks at the Scranton CYC. It was always a big draw ? but ? for several years it was constant sell-outs (approx 6,000?). Chief Jay Strongbow was a phenomenal draw in Scranton during his peak. He, Pedro Morales, and Bruno Sammartino, among other babyfaces always prevailed in the “ultimate showdown” (cage, death, strap ? whatever type decisive match). Such was not the case with George “The Animal” Steele and Haystacks Calhoun. The match was at least the second (if not the third) main event between them. Joe Louis was the referee. Steele pulled out his knife, cut Calhoun pretty good (blood everywhere), and knocked him out of the ring. Joe Louis counted Calhoun out and declared Steele the winner. The arena went wild!!! The CYC was primarily a basketball arena. The wrestlers came from each of two locker rooms ? one for the heels and one for the baby faces. Along the back wall heading to the Heels dressing room were a series of double doors exiting to the alley behind the CYC. Before getting there, the wrestlers walked through the ringside seats and alongside a section of the bleachers. The CYC was totally filled ? SRO. As Steele walked past the bleachers, a young boy (10-12?) jumped on his back. With a single one-armed motion, Steel grabbed the boy and tossed him back into the bleachers. (At this point, I should add that Scranton was still pretty much a coal miner town with a coal miner’s mentality.) THE ENTIRE SECTION OF THE BLEACHERS came after Steele, chased him through the double doors, into the alley and down the street. Steele was literally running for his life. The other “heels” all ran from the dressing into the alley, formed a circle around Steele, and eventually wedged their way back into the arena and dressing room. The “focal point” of the circle was Iron Mike McCord (later, I believe, Austin Idol). Steele and the other wrestlers ran “away” from the crowd with Steele in the middle. McCord “faced” the crowd, taking slow and deliberate steps backwards while basically pounding to the ground anybody trying to get trough him to Steele. McCord was quite a sight ? I believe he saved Steele from real harm that night. I’m surprised I was never able to find mention of this in any internet site that discusses wrestling. I’ve seen the card identified by sites that chronologically list wrestling cards for each year. However, you would think such an event would gather a little more discussion. George Steele responsed: That is not what happened Brad. I never went in the ally and ran. The locker room door was next to the exits. There was two doors at each end of the locker rooms and the fans came in both doors. The way cleared by police and the wrestlers. The Police did walk me to our car. There was no real problem. I did not cut Stacks with a knife. God Bless. George Steele (still wrestling as a heel) had a brutal feud with The Sheik, another legendary Detroit madman. May 3, 1980: Geroge Steele and Frankie Lane beat John Bonello and Randy Scott to win Detroit’s version of the World Tag Team titles. ~~~This would be the only title George Steele would hold during his entire career. ~~~May 24, 1980: John Bonello and Randy Scott recaptured the World Tag Team titles from George Steele and Frankie Lane. 1981: George Steele also worked the Georgia territory as a tag team partner of Dusty Rhodes for a limited period. 1970s: George Steele moved onto the World Wide Wrestling Federation as a monster heel managed by Mr. Fuji. George Steele feuded with the legendary Bruno Sammartino over the WWWF World title, usually losing by DQ. George Steele also engaged in an extensive feud with Gorilla Monsoon. George Steele was later managed by “Classy” Freddy Blassie, and then the late Grand Wizard, and Johnny Valiant. 1984: George Steel was turned face by Captain Lou Albano ending a long heel run. George Steele’s character went from being brutal and wild to somewhat goofy, his trademark “green tongue” and eating the corner pads. 1986: George Steele developed a crush on Miss Elizabeth and began a feud with Randy “Macho Man” Savage. Wrestlemania III: George Steele helped Ricky Steamboat defeat Randy Savage for the Intercontinental title. 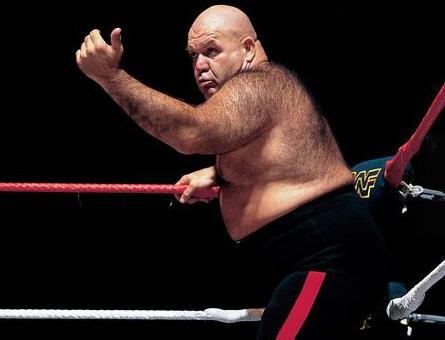 Wrestlemania IV: George Steele was scheduled to compete in a battle royal, but “screwed up his knee” on the way to the ring. ~~~At this event, held at Trump Plaza, they had some horrible steps on the entrance way which George got tripped up on. During the late 80s, George began bringing a raggedy puppet mascot to the ring with him. he called it “Mine”. Late 80s: George left the WWF and worked for numerous independent promotions around the US. George Steele had a leading role in the movie “Ed Wood”, which won two Oscars. October 3, 1996: During an episode of Seinfeld called “The Bizarro Jerry”, where Jerry dates a woman with ‘man hands’. December 29, 1997 – RAW: George Steele made an appearance as Taka Michinoku’s partner vs Brian Christopher and Jerry Lawler. December 21, 1998 – Heat: George Steele returned as a member of The Human Oddities, along with Kurrgan, Golga and Giant Silva. James Meyers is inducted into both the Michigan Coaches Hall of Fame and the World Wrestling Federation Hall of Fame. George Steele begins working on a book that covers his 40 year career in the wrestling business. January 10, 2000 – Nitro: George Steele defeated Jeff Jarrett in a “bunkhouse brawl” with help from Arn Anderson and Chris Benoit. February 29, 2000 – Shakedown: George Steele defeated “Illustrious” Johnnie Stewart for the “presidency” of AWA Superstars. August 6, 2001: Sports Illustrated prints an article about St. Louis Cardinals relief pitcher Steve Kline. ~~~Kline explains that his athletic inspiration was George “The Animal” Steele! ~~~Kline discusses Steele’s heel days, saying “I want to be the guy that fans throw drinks and popcorn at. George “The Animal” Steele is going to appear in a new wrestling video game called “Legends of Wrestling” for Sony Playstation 2. Mighty Ions have an album called ‘Face Rakin’ Rock’ that has George Steele on the cover and includes a song named after him. October 5, 2007 – National Wrestling Superstars: The Odd-It-Tees w/George The Animal Steele defeated Sal Sincere and The Equalizer. October 6, 2007 – NWS: The Odd-It-Tees and Slayer w/George Steele beat Sal Sincere and The Equalizer and JD Smooth w/Royce Profit. June 8, 2008 – TNA Slammiversary: Jay Lethal and So-Cal Val’s wedding was interrupted and ruined by the “Best Man” Sonjay Dutt. ~~~George “The Animal” Steel, Kamala, “Birdman” Koko B. Ware and Jake “The Snake” Roberts attended the wedding ceremony. October 1, 2010 – Northeast Wrestling: George “The Animal” Steele made a special guest appearance in Waterbury, Connecticut. ~~~Matt Tavern and “Waterbury Police Officer” Mike Trip w/George Steele defeated Brian Anthony and Bull Dread w/Kurt Adonis. ~~~The Animal walked out to the ring to a big pop and proceeded to rip and eat the stuffing out of one of the corner pads in the ring! February 19, 2011 – National Wrestling Superstars: George “The Animal” Steele made two appearance as a tag team manager. ~~~J.D. Smoothie and Corey Havoc (w/Gigalo Joe Jones) beat Neko the Monkey Man and Botchagalup the Banana Boy (w/George Steele). ~~~The Nigerian Nightmares and Niya w/George “The Animal” Steele defeated Saddam Insane and Smith James and Jana w/Gigalo Joe Jones. George “The Animal” Steele passed away on February 16, 2017.